My favorite movie house was the Lakeside on the 4700 block of Sheridan Road. From my back porch on the 2nd floor of 4737 Kenmore, looking straight across over the garage roof tops and across the alley was the back fire escape of the Lakeside, which led right into the projection room. One day while I was playing in the alley, the projectionist came out on the fire escape and waved me over, threw down a quarter, and told me to get him some coffee from Happy Jacks, a deli at Lawrence and Sheridan, on the S.W. corner, which I did. I brought it up to the back iron door and he let me come in and watch whatever movie was playing. Mom and Dad were coffee drinkers, so a couple of times a week I would knock on the back door with a coffee pot then retrieve it at end of day. At Broadway and Lawrence we had the Uptown and The Rivera. On Sheridan was the Lakeside and the Pantheon; farther south was the Sheridan, later to become a synagogue. And just on the other side of Irving Pk Blvd. was the Mode (we pronounced it mo-day). The Mode was Saturday matinee fare, two westerns, 10 cartoons, and two serials all for 12 cents. 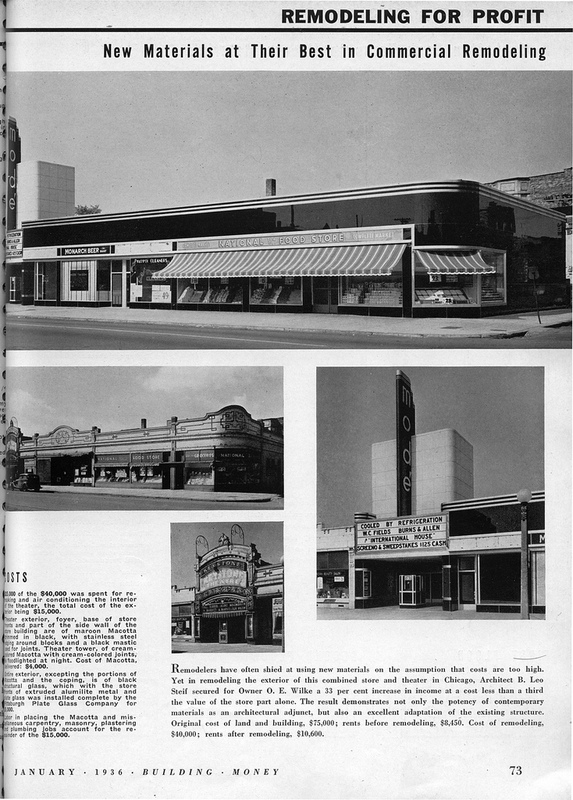 The Mode, showing its original facade from when it was a Keystone theatre and a later remodel. From Flickr user BWChicago. On the extreme north of my area was the Argmore, on the N.W. corner of Argyle and Kenmore. Actually, I think it was a door or two off the corner. I would go there with my mom because they would give plates and dish cloths as premiums. I saw two great serials there, the first Batman and another serial the Monster and the Ape . Now there were two other theaters worth mentioning, just a little out of the area One was the Vogue. The Vogue was on Sheridan Road, but where Sheridan runs east for a bit, just south of Irving Park. The Vogue had seats built for two. Great to make out in. That's when making out consisted of putting your arm around the girl and maybe a kiss. The other theater was the Julian on Belmont Ave, just a couple of doors east of the EL tracks. We went to the Julian sometimes on Saturday for the westerns. The ushers wore cowboy garb and they made us check our cap guns at the candy counter. They had saddles hanging on the walls. I have a collection of old movie serials that I still watch. The other night my 5-year-old grandson and I watched the first 7 chapters of Captain Marvel , and he loves them. I'm in my glory. He's staying over Friday and wants to see the rest. This is probably my favorite part of the blog. I love hearing stories from people who used to live here. Thank you Bill for sharing your memories. Does anyone have a picture of the Argmore from when it was still a theatre? The building still exists, and houses Foremost Liquors. I remember going every sunday after dinner, which was at noon sharp. We wre really pissed when they raised the price from a nickel to a dime. My dad would give my brother and I a quarter which got us into the theater with a nickel left over for candy.There was always a double feature plus cartoons and movietones news. If a movie was in technicolor that was special. Don't forget the Deluxe theatre on Wilson between Clifton and Racine. A real dump even when I was growing up there. Lived at Sunnyside and Clifton from very early 40's to 1955. And Skooglands Swedish bakery at Wilson and Clifton.